Favorite Credits: The Music Man (Tenor in Barbershop Quartet), Performing at The Bowery Electric, Undiscovered Countries at Bizarre Bushwick, and Johnny Darlin: In the Closet opening in FringeNYC! Why theater? : Theatre has allowed me to take all of my main interests – filmmaking, pop and punk music, and narrative storytelling – and throw them into one cohesive show. This has been a dream of mine for as long as I can remember, and theatre, and the Fringe Festival specifically, has allowed me this platform, and opened my mind to what these songs I’ve been working on for so long are capable of saying! 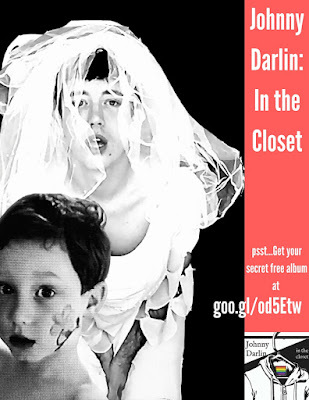 What inspired you to write Johnny Darlin: In the Closet: For a long time, I was doing open mic nights and singer-songwriter-y piano shows at local bars. This was fun and got me “out of the closet” as a performer but this was never the manner I saw myself performing, as a kid. I love big pop music shows where a story is told through multimedia, and it’s a big time party production. I challenged myself to write MY version of THAT – MY version of Britney Spears’ “Dream Within a Dream” tour or Beyonce/Jay-Z’s “On the Run” tour, or Madonna’s “Blonde Ambition” tour. And this became Johnny Darlin: In the Closet! What kind of theater speaks to you? What or who inspires you as an artist? : Anything unconventional, strange, or challenging. For instance, I love the New York Neo-Futurists for always pushing the boundaries in ways that shock, awe and titillate. I’m trying myself to become braver as an artist, so anyone already braver than me has my full attention! What show have you recommended to your friends? : The Illusory Adventures of a Dreamer, Interludes, and The Extraordinary Fall of the Four-Legged Woman, all opening in FringeNYC 2016! If you could go back in time and see any play or musical you missed, what would it be? : I often have dreams about going back in time and seeing Britney Spears’s “Dream Within a Dream” tour from 2001-2002 again. She wore a short black wig the whole time I saw her perform it in Little Rock, Arkansas. In my fantasies, I’m invisible and can sneak up to the front to see if I can register in her face WHY she did this. If you weren’t working in theater, you would be _____? : I’ve been an administrative assistant, so maybe doing that like…more than I do now. What’s up next? : I am fully focused on Johnny Darlin: In the Closet opening at Drom in New York City on Aug14 at 12:30PM, Aug16 7:00PM, Aug17 5:30PM, Aug24 6:00PM, Aug26 9:00PM! I would be BEYOND honored for anyone to come and please feel free to hit me up at the links below if you have any questions about the show!